Bunkers are an integral part of most golf courses and have their origins in the wastelands of the early links courses that were built on the wind-blown sand dunes of the Scottish coast . From these humble beginnings, golf is now played in all corners of the globe and golf courses have adapted to all manner of environments both natural and manmade. Whether a course is in the mountains of Canada, the deserts of the Middle East or as the lungs of a new city in China the course will almost certainly have bunkers. As golf course architects, we use bunkers as a key strategic element of the game and as an aesthetic tool to create a memorable sense of place. Bunker styles and quantity vary dramatically from course to course and place to place in response to the particular conditions of the site, the Architect’s design preferences and the purpose of the course. The contrast between the bunker styles at this year’s Major championship venues illustrates that a variety of styles can be used. The Augusta National, the venue for The US Masters, has relatively few bunkers and they are generally concentrated around the greens, leaving many fairways without bunkers. The sand is pure white and flashed up the bunker faces to contrast with the perfectly manicured turf and the dense landscape backdrops. Pebble Beach, the venue for The US Open, has bunkers built in a classical style. On the downhill short 7th the bunkers are used to frame the hole and to stop balls running off into the Pacific Ocean beyond. The course is more memorable for its spectacular seaside setting rather than for its bunkers. Whistling Straits, the venue for the US PGA Championship, was designed by Pete Dye who is famous for his deliberate distortions of traditional design elements. The course boasts an incredible 1400 bunkers but most of them are sandy wastes used to create a memorable landscape setting. In contrast to all the above is the Melbourne Sandbelt which capitalises on its abundance of free draining sand and is characterised by large bunker complexes. Whilst these bunkers are relatively economical to construct they demand a lot of costly attention to maintain them to the high standards demanded by the members. At some courses the constant trimming of the bunker edges has caused the bunkers to grow over time, which changes the bunkers’ appearance. Every golf course architect responds differently to the land at his or her disposal and their individual response would vary from day to day depending on their mood. In reality there is no strict rules with bunker design although bunkering strategies can be either penal, strategic or heroic or a combination of each. Some architects have a recognizable “one size fits all” approach whereas others experiment with a range of styles. 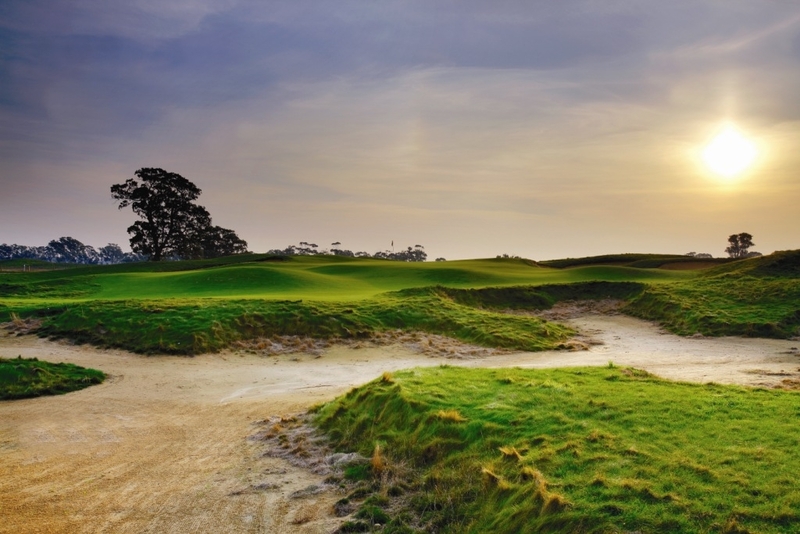 The Open Course at Moonah Links was purpose built for Championship play and the bunkers are strategically arranged and are unashamedly quite penal – deep with steep faces. The bunkers are to be avoided at all costs but there are 5 greens without any bunkers, and a further 5 with only one bunker. On these holes slopes and hollows are used to create the difficulty. The bunkers on the Legends Course in contrast are less severe and have a wilder free-form style and a more natural appearance. Construction of the bunkers was easy given the sandy site which allowed the bunker complexes to play an aesthetic role framing holes and improving legibility. The recently opened Hamilton Island Course was built on a windy uninhabited rocky island and it was very difficult to construct bunkers due to the surface rock. Bunkers were used sparingly and generally modest in size and reasonably deep to prevent the wind blowing away the sand. All the sand for the bunkers is barged in from the mainland which is a costly exercise. The site for the Carya Course in Belek, Turkey was reminiscent of the Surrey Heathland given that was undulating sand dunes covered with a conifer forest with an understorey of heath. It was decided to develop this as a theme for the course to set the course apart from the other dozen courses on what is a masterplanned tourist strip on the coast of the Mediterranean coast. To complete the picture over 1 million local heathland plants were grown and planted in the carries and on the bunker faces. Bunkers will continue to be an important element of golf course design – new styles will emerge and others will go in and out of fashion. Hopefully common sense and sustainable bunkering strategies will be adopted in response to site conditions and the course brief.